Now that we’ve seen some simple examples of how to use MassTransit with the Publish/Subscribe pattern on multiple machines, let’s build something that resembles a more real-world app. 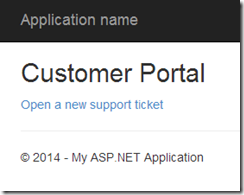 In this article, we’ll build an ASP.NET MVC Customer Portal app where a customer can create a new support ticket. The ticket will be published onto the service bus. We’ll create a Windows Service to be the subscriber of these messages and it will handle the tickets, in this example, sending a confirmation email to the customer. You can get all the code from this blog post at https://github.com/dprothero/Loosely.CustomerPortal. So let’s dig into the code to build this web app. In the “New ASP.NET Project” select the “Empty” template and check the “MVC” box under the “Add folders and core references for” heading. This is the message type we will publish onto the service bus whenever a user of the web application wants to open a new support ticket. Now let’s add another class library named “Loosely.Bus.Configuration” where we’ll keep our common MassTransit configuration code. Add the MassTransit.Log4Net and MassTransit.RabbitMQ NuGet packages to this new class library. You may recall, in a previous post, when we did the same thing. In fact, this code is nearly identical. The only thing we’ve changed is the prefix for the queue name. In that earlier post I describe what we’re doing here in detail. In summary, we’re setting up a new instance of a MassTransit service bus that will use RabbitMQ for it’s transport mechanism. Returning to the Loosely.CustomerPortal.WebApp in our solution, right-click on References and add project references to the Loosely.Bus.Configuration and Loosely.Bus.Contracts projects. Also, add the MassTransit NuGet package to the project. We’re adding a public, static property to the MvcApplication class that we can use elsewhere in our application to get access to our service bus. In the Application_Start event handler, after the routing code added by Visual Studio, we can use our BusInitializer class to create a new bus and assign it to the static property. Later, when we want to use the bus, we’ll simply use the expression MvcApplication.Bus. Don’t forget to call Dispose on the bus in the Application_End event. Still within the WebApp project, add a new model to the Models folder and call it “Ticket.” This will be the model we will bind our support ticket data entry form to. 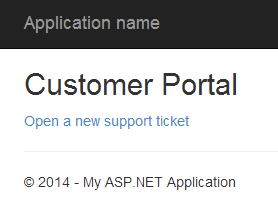 We’ll also have it implement the TicketOpened interface so we can publish it to our service bus. Because we want to be able to tell the user what their ticket ID is right away, we need some method to generate a statistically unique, random ID. GUIDs work well for this in terms of being easy to implement for a developer, as it’s a single line of code. They aren’t a great user experience, of course, due their length. The point to remember is that we need a way to generate an identifier that we know should be unique in whatever data storage repository we will be storing the tickets in without having to consult said data storage repository. Remember, the reason we’re using a service bus is to have this web application loosely coupled to whatever backend is used for our ticketing system. When the rubber meets the road, however, you may be integrating with a ticketing system that wants to assign it’s own IDs. In that case, you will have to decide whether the requirement to display the ticket ID immediately to the user is worth a round-trip to the ticketing system to get it. There’s no one right answer. Building systems is a constant series of trade-offs. We also have a Save method that we will call from our controller (coming soon). Instead of what you typically see in a Save method (saving to a database), we’re publishing the Ticket onto the bus. 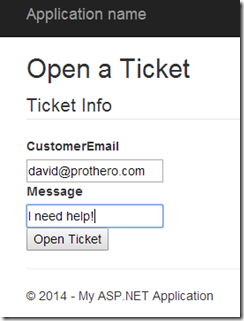 Since the ticket implements the TicketOpened interface from our Contracts assembly, other processes can subscribe to these TicketOpened messages and do something interesting with them. A few interesting things are going on now. First, we’ve got the Open action that’s tagged with the HttpGet attribute. This action simply creates a new ticket model and binds it to the (soon to be created) view. This view will be the data entry form allowing the user to supply their email and message text. The next method is also called Open but is tagged with the HttpPost attribute. This is because when the user submits the form we will still be posting to the /Ticket/Open url (sorry if this is review for you MVC vets). The post action takes in a ticket model that should be populated with the data from the user’s form submission. We take the ticket the user submits and call the Save method on it (which, as you’ll recall, is what will post the message to the service bus). Following the save, we redirect to the Opened action, passing the ticket ID. Finally, we have the Opened action which passes the ticket ID into the view via the ViewBag so it can be displayed to the user. Your ticket has been opened. Checkpoint – The Web App Works, Now What? If you run the web app now, you’ll be able to create a new ticket, and you’ll even get a new ticket ID assigned each time! If you go into the RabbitMQ management interface (see this post for instructions), you will see that there’s an exchange named Loosely.Bus.Contracts:TicketOpened that isn’t connected to any other exchanges or queues. If you’ve been following my blog, you’ll know this is because we don’t have anyone listening for these types of messages yet. 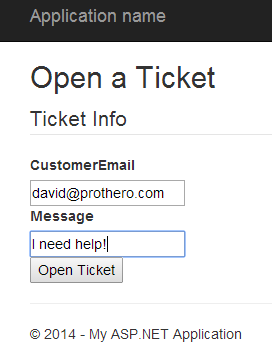 It’s time to do something with these tickets that are being created by the web app. Let’s create a Windows service that can run in the background on any machine and subscribe to TicketOpened messages that are published to the service bus. We’ll use the open source project TopShelf for creating our Windows service. TopShelf is published by the same trio of geniuses that gave us MassTransit and it makes creating Windows services extremely simple. Start by adding a new Console application to our solution and name it Loosely.CustomerPortal.Backend. Add project references to Loosely.Bus.Configuration and Loosely.Bus.Contracts, as well as a framework reference to System.Configuration. Finally, add NuGet packages MassTransit and TopShelf to the project. First, let’s setup a little configuration so that TopShelf will log any messages to a log file we can create. We’ll also setup the configuration to log general Trace messages. To send email messages, we’ll use Gmail’s SMTP server, so we also need some place to store our Gmail credentials. Notice we’re logging messages to C:\Logs\Loosely.CustomerPortal.Backend.log, so be sure to create a C:\Logs folder (or change this path to somewhere else you might prefer). Nothing magical here. We just pull the Gmail credentials out of our config file and then open a secure connection to Gmail’s smtp server to send a message. Obviously, in a true production app, this code would be written to connect to the appropriate SMTP server and likely not use Gmail like this. Gmail works well for a simple example, however. This is the real meat of the backend service. The Consume method will be called for every TicketOpened message that MassTransit picks up off the bus for us. In this example, we’re simply logging the information from the ticket and then sending the confirmation email to the customer. The Start method is the perfect place to put our bus initialization code. 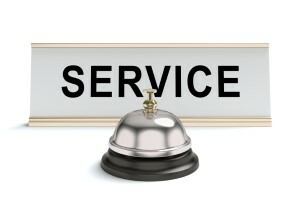 Notice how we are adding a subscription in MassTransit and providing it our TicketOpenedConsumer class. We’re also making it a permanent subscription. I’ll refer you to the TopShelf documentation for details on how TopShelf works. For this example, you just need to know that this code wires up our TicketService class to the TopShelf framework. The great thing about TopShelf is you can just run the executable and it will run your program as a standard console app. If you run it with the “install” command line parameter, it will install it as a Windows service. Right-click on the solution and choose “Set Startup Projects…” and make both Loosely.CustomerPortal.Backend and Loosely.CustomerPortal.WebApp startup apps. Run the solution and you’ll get a web browser with the web app and a console window running your new service. Now you should be able to launch the Windows services MMC snap-in (services.msc) and see the new Loosely.CustomerPortal.Backend Windows service and fire it up! With the service running, you will want to change your Visual Studio solution back to having only the web app as the startup project. Now that we’ve built this app, I’d like to refer back to it in future blog posts so we can refine it to be more robust and “enterprise-ready”. Let’s use it to look at things like message retry logic, sagas, and multiple subscribers (for scale or for different functions). As always, let me know if there’s anything specific you’d like to see me write about. awesome cant wait to see sagas in action! Hi, where is the saga part?